Shinobu was a shugenja of the Snake clan 800 years ago, before its downfall. Recently, she reappeared as the reincarnation of Nakata Jin. Shinobu was originally born as the daughter of Chuda Choro (daimyo of the Snake clan), and sister of Chuda Tamihei (famous as the one who gave in to Maho, thus causing the downfall of the Snake). After their father died, Tamihei began learning blood magic from the Shuten Doji, which he intended to use to try to help his father. Of course, deals with oni being what they are, his desires were twisted during the learning process. After learning the ways of Maho for seven days straight, he returned to Shinobu and told her of his plan to try to bring their father back. Realising that it would be wrong to use the blood of an unrelated innocent, she offered her own life blood for Tamihei to use. Tamihei accepted, and used enough of his sister's blood to kill her. She died in the year ???. 800 years later, a group of heroes, including Isadora, Kuni Sang and Kakita Bei went into the shadowlands, to rescue both Typhenon, who had been captured by Thyrul, and the soul of Nakata Jin, who had been killed earlier by another lich, and whose soul had been taken by Thyrul. The group found what they thought was Jin's soul in a crystal ball, and they fled the tower with it after also finding Typhenon. While fleeing, however, they dropped the crystal and broke it. When this happened, a young, unconscious naked girl appeared, who later turned out to be Shinobu. Unwilling to risk another journey through the shadowlands, especially with the group so depleted and now with a young defenceless girl, the group used Typhenon's magic to teleport directly back to Epiach. Unfortunately, there was a large battle going on in Epiach in the very room they appeared, and it was in amongst this battle that Shinobu awakened. Since then, she has been talking with various people, mainly Isadora and Sang, and has been learning what has happened in the past 800 years, beginning with the fall and destruction of the Snake clan. She has also been revealing something of herself, and it appears as though she retains her own memories, as well as at least some of the memories and skills of Jin. None yet - when reincarnated, she appeared as a naked young girl, and wag given a blanket to wear. 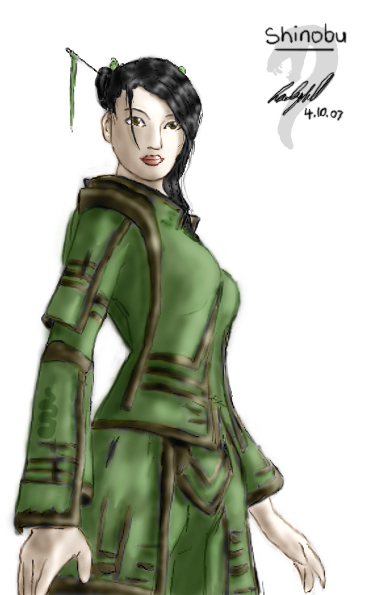 Since then, she has received some real clothing, including a very nice kimono from Usami Maiko of the Mantis clan. Currently travelling from Epiach on the ship of Moshi Maiko (the Silver Serpent, along with Isadora and Hida Sang, in order to return to the lands of the Silverstars Empire.